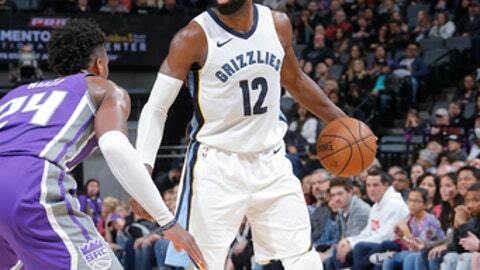 SACRAMENTO, Calif. (AP) Tyreke Evans’ decision to gamble and sign a one-year deal with Memphis this past offseason is looking increasingly more like a safe bet for the veteran guard. His troublesome right knee is no longer bothering him as much, either. Evans had 26 points, seven rebounds and five assists against his former team and the Grizzlies beat the Sacramento Kings 114-96 on Sunday. The 2010 rookie of the year saw his stock drop after multiple knee surgeries that cost him 99 games over the past two seasons before he signed with Memphis. Healthy this season, Evans is looking more like his former self. Evans has scored 20 or more in 19 games this season and is shooting a career-high 42.6 percent on 3-pointers. Zach Randolph, a two-time All-Star over eight seasons who helped Memphis reach the 2013 Western Conference finals before signing with Sacramento in the offseason, had four points and six rebounds. Randolph spent most of the game going against Gasol, his longtime teammate. Grizzlies: Gasol was called for a technical foul in the fourth quarter after arguing with an official. … Memphis shot 60 percent (12 of 20) in the first quarter. Kings: Mason limped off the court with a bruised left heel after making two of three free throws on the foul by Chalmers. Mason, who appeared to get hurt a few plays earlier, did not return. Grizzlies: At Los Angeles Clippers on Tuesday night. Kings: Host Charlotte on Tuesday night.